Why is it important to have an alkaline body? Today we wanted to talk about the pH of foods. The pH scale measures how acidic or alkaline a substance is and ranges from 0 to 14. Seven is neutral. 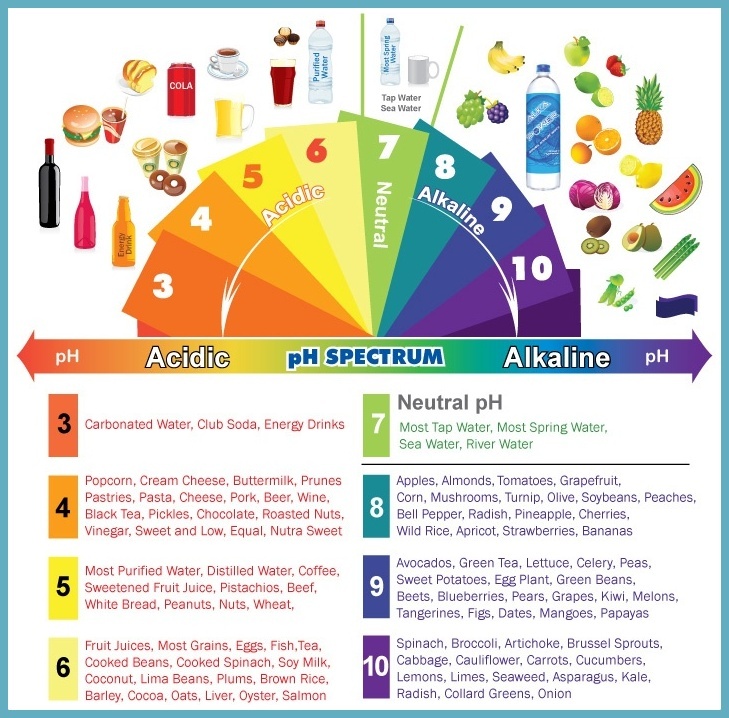 Below 7 becomes increasingly acidic, above 7 increasingly alkaline. Proper pH varies throughout your body for many reasons. For example, your bowels, skin and private parts should be slightly acidic – this helps keep unfriendly bacteria away. Saliva is more alkaline, while your urine is normally more acidic, especially in the morning. But by far the most important measurement is your blood. For optimal cellular health, your blood pH must be slightly alkaline with a pH between 7.35 and 7.45. Our bodies are programmed to maintain this range no matter what, since even the slightest dip or rise in pH can have seriously dangerous consequences. Now here’s the problem: a diet based on meat, dairy, processed foods, refined sugar, coffee, and alcohol is rife with acidic substances. In addition, environmental toxins can be acidic too, and sadly those are pretty damn hard to avoid. They hide in plastic, body products, house cleaning products and, extensively, in polluted air. Since some of the acidity promoting toxins are hard to avoid, we should focus on consuming alkaline foods. Here’s a very easy-to-read table on food’s pH; you could print it and place it on your fridge door, or save it on your phone so that you have it with you when you go shopping. ← Why is it important to consume legumes?